How Many Bad Puns Can I Squeeze Into My ‘Star Trek’ Review? There aren’t many people that would want George Lucas to have any more cash, and even fewer that would want him to earn it on the back of ‘The Phantom Menace’, but Hollywood owes the guy at least a pint or two for making the notion of the prequel such a draw. Because from Bond to this week’s ‘Wolverine’, cinema-goers are lapping up the idea of where their favourite franchise characters originated. ‘Star Trek’ (11) takes this idea to warp factor 9. (Bad Pun Number 1). 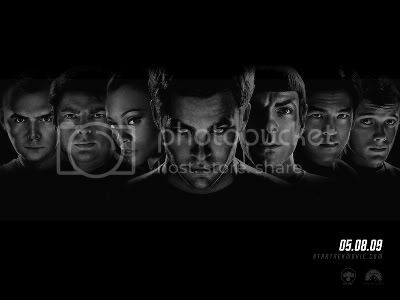 Kicking off with an incredibly tense and surprisingly emotional pre-credits sequence, the 11th Trek film then jumps from world to world encompassing Iowa and Vulcan and transporting (Bad Pun Number 2) between several time zones from Baby Kirk to Teenage Spock to where the heart of this movie lies, Young Adult Spock (Zachary Quinto) and Kirk (Chris Pine). The former fighting his eternal battle with Bjork’s idiom that there is definitely, definitely, definitely no logic to human behaviour and the latter drinking heavily, bar-fighting and trying to lay Uhura. Apart from the last part it’s clear this is a new, ’00s Trek. And it is. JJ Abrams has done an impressive job in making this ‘Star Trek’ but not as we know it (Bad Pun Number 3). How he’s done it – by using a tried and tested Trek device of ‘the alternative Universe’ – is his wisest move in cinema yet, as he gets to make the world his own but with the added bonus of keeping all the same characters that fans know and love. Perversely it’s the nods to the original that are many of the highlights. Be it Chekov’s V pronouncing disability, Uhura’s alluring miniskirt or the introduction of an unrecognisable ‘Red Shirt’, these are the parts that stay with you after the film has finished. Sadly though this pandering to the fanbase is responsible for a mid-section segment that fits painfully with what has gone before (Bad Pun Number 4). Without giving away spoilers I’ll just say it involves Kirk being chased around the ice planet of Hoth by weird creatures (as Kirk is wont to do) before running headfirst into a coincidence fatter than James Doohan’s stomach. But this is a minor slight on a film that I was convinced would be far too po-faced for my tastes. Instead it’s exciting (the opening and closing set-pieces), funny (comic highlight being Bones’s Jimmy Stewart worthy intro) and looks pretty frecking great (the fact that not once did I notice the SFX is high praise indeed).